You can spend the entire winter season indoors, curled up on the couch, waiting for it to all be over so you can finally leave the house again, or, better yet, you can make the best of it by taking in some attractions that simply couldn’t exist during the spring, summer, or fall. If you live in an area where winters are cold and snowy, odds are you will have the opportunity to take in an ice and snow show of some kind. The definition of ice or snow show can vary – there are endless opportunities for fun in the winter! Take a look through your community listings and you can find anything ranging from ice sculpture exhibitions and igloo building contests, to snowshoe demonstrations and ice hotels. Some ice and snow shows are strictly just shows, where an audience gets to watch an activity taking place or some kind of art or skill on display. This category includes things like ice sculpture and snow sculpture. Some winter events, on the other hand, encourage participation, allowing you to get your hands dirty (and cold), and throw yourself right into the center of all of the fun. Some participatory winter activities are really hands-on. If you are active, curious, and interested in trying new things, this is the type of event for you. 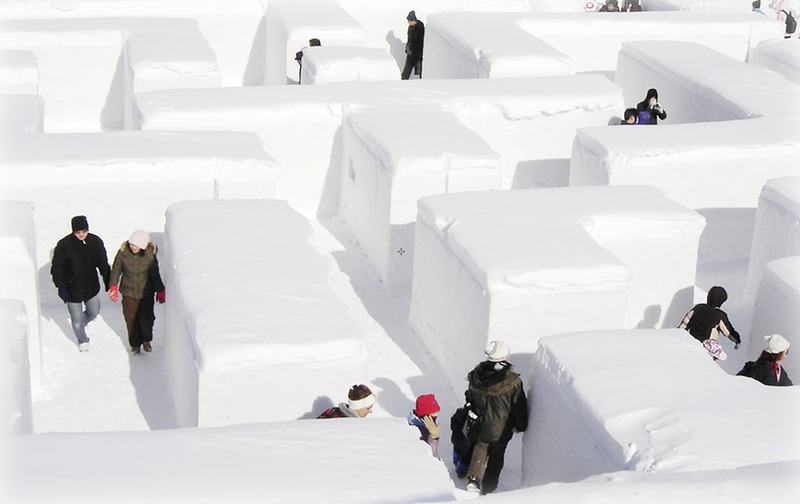 Have you ever participated in competitive igloo building? Well now might be your chance. You’ll get to spend dome time in the great outdoors and hone your architectural skills all at the same time. If building an igloo sounds a little too technical for you, try participating in a snowshoe demonstration. Many athletic clubs put them on to give people the chance to test out snowshoeing. Be warned: you will leave wanting a pair for yourself! If you don’t see any events in your community that will allow you to make the most of snowy weather, put on your own snow show! Plan a community snowman building contest or a neighborhood snowball fight. A snowball fight is a great way to stay active and get back at your noisiest neighbors all at once! Some communities plan ice and snow shows that allow for more minimal participation. These events are perfect for people who enjoy being outside, but would rather not exert too much energy. If you fit in to this category you might want to check out some cultural exhibits, such as maple taffy demonstration. Maple taffy (also known as tire d’érable in Quebec where the tradition is most prominent) is made by pouring boiling maple syrup onto fresh snow, and rolling a popsicle stick in it to collect the syrupy snow in a lollipop. The mixture hardens after a few seconds, producing a delicious, chewy, sugary treat. This is a great winter activity for all ages. It allows for participation, doesn’t force you to expend too much energy, and has a pretty great payoff! Another high-participation/low-effort winter activity is visiting an ice hotel, should you be lucky enough to live in or visit a city that houses one. Ice hotels are exactly what they sound like – hotels carved entirely out of ice! Don’t worry; you don’t have to spend the night in your parka, surrounded by cold, see-through wall. You can just go and tour the hotel. You will be amazed at how beautiful it is and how precisely it’s all put together. There is no snow show quite as magnificent as an entire hotel made from snow and ice! You will have to see it to believe it. Of course, there are other more traditional ice and snow shows to take in. Ice sculpture is always a big hit. It’s amazing to see what these artists can make out of a block of ice and a chain saw. Snow sculpture shows are pretty similar to their icy counterparts, but with very different techniques. Even if you’ve already taken in an ice sculpture exhibit this season, you shouldn’t pass up the opportunity to see some snow sculptors at work. Their array of tools might not be as exciting as those of ice sculptors, but they certainly are unique – expect to see everything from wooden dowels to butter knives. Whether you’re looking for something traditional or unique, whether you want to participate or stand and watch, there is bound to be a winter activity that can help you get off of that couch and into the great outdoors! This article was written by Ramona Korpan, on behalf of ISA Attractions.com.